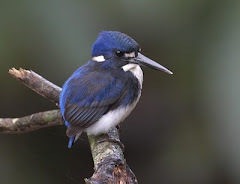 Conditions are good and fruit is plentiful in the Daintree rainforest at this time of year and, to coincide with this, many birds are breeding before the wetter and more difficult conditions arrive. A Yellow Oriole nest we have been faithfully watching in the garden struck problems a couple of days ago when the single chick left the nest too early - it seems it could 'fly' downwards, but not upwards! After us picking him up and popping him on a branch, Mum and Dad continued to follow him around, feed him and protect him. Fingers crossed they still doing it, despite us not seeing him today. The Black Butcherbirds are feeding their own young at present and are ferocious predators. Hatched and going well (and in great form) are this family of Spangled Drongo juveniles. Mum was sitting nearby, looking pretty tired - all those mouths to feed! 4 healthy and hungry babies. At the other end of the scale, we chanced upon a pair of Wompoo Fruit-Dove just building their nest, along Stewart Creek Rd. A precarious nest at the best of times, with only a shallow platform of a few sticks. The ritual of 'passing the stick' is beautiful to watch though. Good luck to them! A quick trip out on the Daintree River and up Stewart Creek with friend and birding guide Ellen Terrell, yesterday evening, yielded a great haul of very special birds. 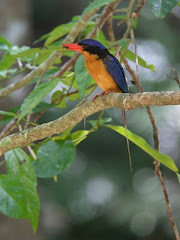 Great-billed Heron, several Black Bittern, Nankeen Night-Heron, Papuan Frogmouth and chick, Azure Kingfisher, Wompoo Fruit-Dove, and many, many more. It was a great pleasure to be there. Still plenty of Magpie Geese feeding in the fields during the day, plus a flock of about 40 Wandering Whistling Duck and 7 Hardhead. Still looking for the Spotted Whistling Ducks! I love to see those bird, Bird watching is very fun to do.